A national litter survey has found that many Irish towns and cities are cleaner than our European counterparts. 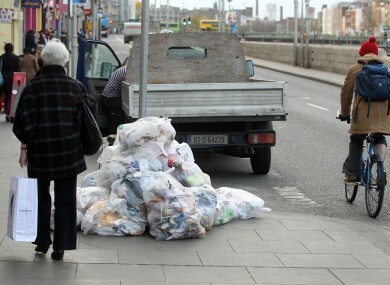 A NATIONAL SURVEY on litter has found that litter levels in Ireland are continuing to fall. The study, carried out by Irish Business Against Litter (IBAL), surveyed over 40 Irish towns, cities and urban areas and found that over 83 per cent are now considered to be as clean if not cleaner than our European counterparts. Following last years controversial results on Dublin, there is better news this year, with the survey showing that for the first time in 18 years, Dublin city centre has ended the year as “clean”. Last year, Dublin City Business Improvement District (BID) said it was disappointed with IBAL’s survey which they said presented Dublin as “dirty”. However, IBAL warned that the north inner city remains a litter blackspot and found that the number of vacant commercial properties was becoming a major issue, with the group suggesting that a task force be established, like that in the UK, to tackle the problem. Areas like Ceannt station in Galway were praised for its cleanliness, while areas like Dublin’s Upper Birmingham Street and Marlborough Street were described as being in a “terrible state”. Ireland’s top three cleanest towns were: Cavan, Kilkenny and Tramore. The overall winner will be announced later today. IBAL was set up by companies in 1996 who believe that making Ireland’s towns and cities litter-free will help improve our economic well-being. Email “Dublin city centre achieves clean rating for the first time in 18 years ”. Feedback on “Dublin city centre achieves clean rating for the first time in 18 years ”.